He’s a household name; every third person on the metro is clutching his new book; his Twitter has 550,000-odd followers and they’ve begun selling his books in box sets. Even I’ve read four out of his five books—mostly out of curiosity. His books have a formula to them: young people have ‘scenes’ (for those of you who don’t know, that’s Bhagat’s favourite synonym for a relationship) and chase success in a modern world where their language is filled with phrases Bhagat believes are cool. And of course, there is not a speck of proper grammar. Anywhere. 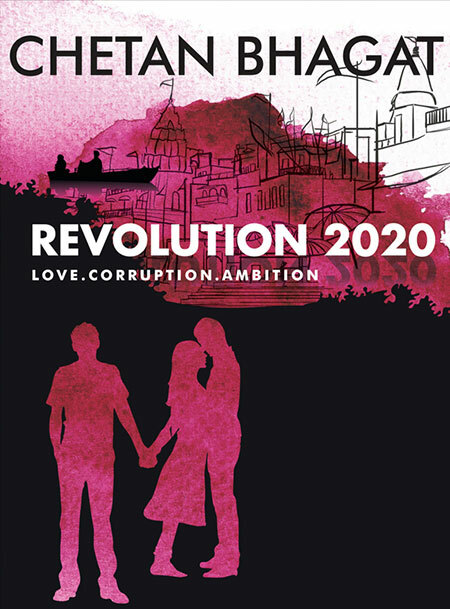 Revolution 2020 (click here to purchase) is about three childhood friends: Gopal, Raghav, and Aarti. Gopal and Aarti are close growing up, and while she just sees him as a friend, he falls in love with her. He hopes and almost expects Aarti to come around at some point, and she in turn encourages him with a casual remark here and there that suggests she isn’t completely indifferent. But Aarti pulls the ground out from under his feet when she discloses that she is having a ‘scene’ with Raghav. From this point on, the three will be tangled in a constant fight for power, love, and the chance to chase their individual dreams. When Chetan Bhagat’s characters are in love (and especially when it’s triangular) they will stop eating, working, thinking. In his words, they don’t just love each other, they own each other. Of course. The book also makes a half-hearted attempt to take a jab at corruption and whether life is driven by passion or money. Raghav has his own newspaper called ‘Revolution 2020’, while Gopal builds a college through fraud and brute force. The book is clichéd at every turn. The characters are all mash-ups of Bollywood archetypes. The dialogue is uninspired and hyperbolic. Bhagat’s brand of realism is about replicating superficially his idea of the average Indian. The book is insultingly easy to read, the plot has been written about a few thousand times before, and it’s depressing to think about how most Indian readers want this book by their pillow. Even the ‘Praise for previous work’ section in the book quotes magazines raving about Bhagat’s marketability, not his writing. He’s acknowledged as the man who brought Bollywood to the masses in paperback. He’s a household name in India and I can’t think of a single positive thing to say about his book. Click here to purchase Revolution 2020 online. I don’t hate Bhagat so much for his mediocre writing, but the revolution he has given birth to: a whole generation of mediocre and bad writers who are selling their books in thousands. Does he actually use the word “scene” :| Now, I need to vomit. I do not read him as a thumb rule. Amen! I realized this on my second Chetan Bhagat book….it’s nothing but schtik. I find Chetan Bhagat’s “Well, i write for the average indian” defense to be extremely patronizing as well; as if reading poorly written poor novels is what the ‘average indian’ deserves! And unrelatedly, who made him “youth spokesman”? These days everything is decided by “page rank” …and judging by the moves i see Mr. Bhagat making these days, achieving a steady stream of media-consumable output is decidedly more worthy of Chetan Bhagat’s efforts than coming up with something befitting his ‘earned’ title. It shouldn’t be like that! IMHO, if the ‘commercial writer’ hat he dons fits so well… he should doff the hat of the intellectual. Actually, it’s the publishing houses who realised the goldmine that was the 99-rupee book market and encouraged more crap like this. I beg to differ. I think we tend to dismiss the importance of readability and relatability as criteria for evaluating the worth of a work. Do you prefer to go to the Opera or listen to indie band? Bhagat is mainstream but he challenges the mainstream- a pattern you see repeated in every one of his novels. Not to say that fabulous articulation and the ability to connect with an audience are mutually exclusive but if I had to choose between Bhagat and an author high on linguistic precision/artistic splendour who is tedious to read, I just might choose Bhagat. I find him Chetan Bhagat’s books devoid of any new story line. This having said, all that his books really do is to bring Bollywood home. If you think Bollywood is brilliant cinema, you should find Chetan Bhagat’s books brilliant too! I just came across MyDeals247.com – it is really different way to purchase online..